GP surgeries with doctors who also have training in complementary and alternative medicines appear to be less likely to prescribe antibiotics to patients and may hold the key to reducing over-prescribing of these drugs, suggests a study led by researchers at the Centre for Academic Primary Care and published in BMJ Open today. Inappropriate and over-use of antibiotics leading to antimicrobial resistance are growing problems for international public health, but reductions in antibiotic use have been shown to be associated with a reduction in some resistance. In the UK, 74 per cent of antibiotics are prescribed in primary care making it one of the most important contributors to this development. GPs vary in their prescribing behaviour due to various factors including different views on medicalisation, different guidelines between countries, and use of complementary and alternative medicine (CAM) integrated in their daily practice, also known as integrative medicine (IM). So far, any association between the knowledge and use of IM by GPs and antibiotic prescribing has not been widely scrutinised. The UK, German and Dutch research team set out to examine what differences there may be in antibiotic prescription rates between conventional GP surgeries and those with GPs who had also been trained in integrative medicine using NHS Digital monthly prescribing data for 2016. Data from 7,274 GP surgeries was studied and compared with nine practices that had GPs who had training in integrative medicine, looking at overall prescribing of antibiotics, as well as prescribing of these drugs for respiratory tract infections and for urinary tract infections. 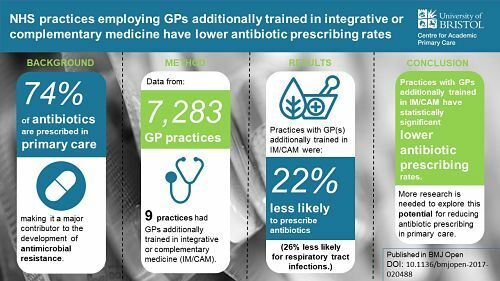 Analysis showed that practices that employed GPs with additional training in IM had significantly lower antibiotic prescribing rates than those with conventional GPs. Prescribing of antibiotics for patients with respiratory tract infections was also noticeably less in practices with IM-knowledgeable GPs. However, there was no difference between the two types of practice when it came to levels of antibiotic prescribing to patients with urinary tract infections. The authors acknowledged that their results were limited by the lack of data on number of consultations, individual GP characteristics, individual deprivation scores and continuum of care. In addition, the pool of practices with GPs trained in IM was small because accessibility of IM/CAM within the NHS in general practice in England is very limited and IM/CAM provision is currently almost exclusively private in the UK. Nevertheless, the authors said that the difference seen in antibiotic prescribing rates at practices with GPs trained in IM warranted further study. The lower antibiotic prescription rates of practices with GPs trained in IM were in line with current national guidance aimed at reducing antibiotic usage and antimicrobial resistance, they said. practices with GPs trained in IM had other avenues to offer to patients than antibiotics. Paper: 'Do NHS GP surgeries employing GPs additionally trained in integrative or complementary medicine have lower antibiotic prescribing rates? Retrospective cross-sectional analysis of national primary care prescribing data in England in 2016' by Esther van der Werf, Lorna Duncan, Paschen von Flotow and Erik Baars. Published in BMJ Open. 19 March 2018. DOI: 10.1136/bmjopen-2017-020488.